Water use estimates and water returns for the ACF Basin were estimated and compiled by category and location during 2010. Categories included public supply, self-suppled domestic, self-supplied commercial, industrial, mining, agricultural (crop irrigation, livestock, and aquaculture), and thermoelectric-power generation. 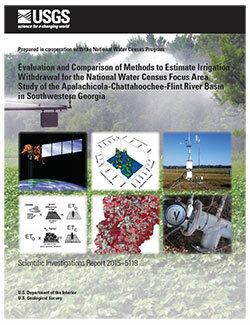 Methods for estimating irrigation water use were compared and evaluated against available metered data. In 2010, an average of 1,645 Mgal/d were withdrawn in the ACF Basin, with about 35 percent of withdrawals coming from groundwater sources and 65 percent from surface water. About 564 Mgal/d (34 percent of withdrawals) were returned to streams and rivers in the basin (mostly as treated wastewater) and less than 4 percent of withdrawals were for interbasin transfers outside of the ACF. 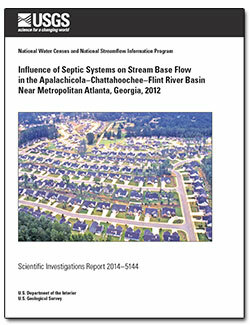 Although population in the basin, particularly in the Atlanta metropolitan area, has increased by 45 percent from 1990 to 2010, surface-water use has declined during that period, most likely due to conservation measures. Conversely, groundwater use has steadily increased due to increases in pumping for agricultural irrigation with spikes in use during drought years. Surface-Water Withdrawals by Use Category: Total is 1,069 million gallons per day. Groundwater Withdrawals by Use Category: Total is 576 millon gallons per day. Surface-water and groundwater withdrawals for the ACF Basin in 2010 by water-use category. The largest use of surface water is for public supply (499 Mgal/d) and thermoelectric power supply (281 Mgal/d). Agriculture is the largest water use in the ACF Basin and estimates of agricultural water use are typically complex, with high levels of uncertainty. To address this uncertainty, three different methods were tested in the ACF FAS to compare their ability to match estimates of irrigation water use derived from metered wells. These methods include (1) crop-demand, (2) geostatistical with variography and conditional simulation, and (3) remote sensing technology to identify irrigated lands. Results are presented in a USGS Scientific Investigation Report (Painter and others, 2015) and indicate that information on local agricultural practices and spatial and temporal distribution of irrigated lands are critical for all three methods. Geostatistical techniques used to estimate irrigation depth. In all three methods evaluated to estimate irrigation water use, information was required on agricultural practices specific to the geographic location and season to produce useful results. 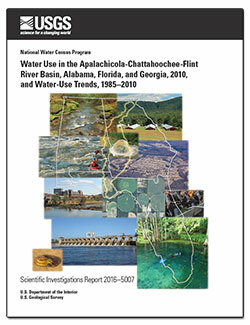 Lawrence, S.J., 2016, Water use in the Apalachicola-Chattahoochee-Flint River Basin, Alabama, Florida, and Georgia, 2010, and water-use trends, 1985–2010: U.S. Geological Survey Scientific Investigations Report 2016–5007, 72 p., http://dx.doi.org/10.3133/sir20165007.